Director – Renny Harlin, Screenplay – Kevin Brodbin & Wayne Kramer, Story – Wayne Kramer, Producers – Cary Brokaw, Bobby Newmyer, Jeffrey Silver & Rebecca Spikings, Photography – Robert Gantz, Music – Tuomas Kantelinen, Visual Effects Supervisor – Brian M. Jennings, Special Effects Supervisor – Harry Wiessenhaan, Makeup Effects – Asylum Models and Effects, Carter White FX, Robs Prop Shop, Lena Sen & Daniel Woodley, Production Design – Charles Wood. Production Company – Intermedia/Dimension Films/Outlaw Productions/Avenue Pictures/Weed Road Pictures/Mindhunters (UK) Ltd/Mindhunters Productions BV/Tonna Oy/Outlaw Victoria Productions Inc.
A group of seven trainee FBI forensic profilers are taken by instructor Jake Harris to an army training facility on Oneiga Island off the coast of Virginia. At the last minute, the group is joined by police detective Gabe Jensen. On the island, Harris tells them that he has set up a simulated profiling exercise for them to solve, involving a fictional serial killer known as The Puppeteer. Soon after the exercise begins, the leader of the group is killed in a trap. Other members of the group soon become victims in a series of elaborately staged traps. In each case, the killer leaves a clock to let the group know when the next victim will be claimed. As the group tries to work out who the killer is, suspicion falls on everyone present who all have possible motivations. They then realise that the killer has profiled them and constructed each of the traps to play into their individual strengths and weaknesses. Renny Harlin is someone who sits on my Worst Directors list (alongside Michael Bay, Joel Schumacher and Stephen Sommers). The Finnish born Renny Harlin first appeared in the US with his third and fourth films, the low-budget haunted penitentiary film Prison (1987) and A Nightmare on Elm Street IV: The Dream Master (1988) and then gained a modest degree of respectability with Die Hard 2 (1990). Throughout the 1990s, Harlin made his name on loud and mindlessly spectacular action films like Cliffhanger (1993), CutThroat Island (1995), The Long Kiss Goodnight (1996) and Driven (2001). The last three in particular were massive box-office flops. Towards the end of the decade and into the millennium, Harlin seemed to demonstrate a predilection for genre material with the likes of the ridiculously entertaining killer shark movie Deep Blue Sea (1999), the universally derided Exorcist: The Beginning (2004), Mindhunters, the supernatural horror The Covenant (2006), The Legend of Hercules (2014) and the Wu Xia Legend of an Ancient Sword (2018). None of these are very good films. Indeed, it could be observed that the opportunities when Renny Harlin deliberately sets out to make a bad film – The Adventures of Ford Fairlane (1990) and Deep Blue Sea – are far more enjoyable than the films that he takes seriously. 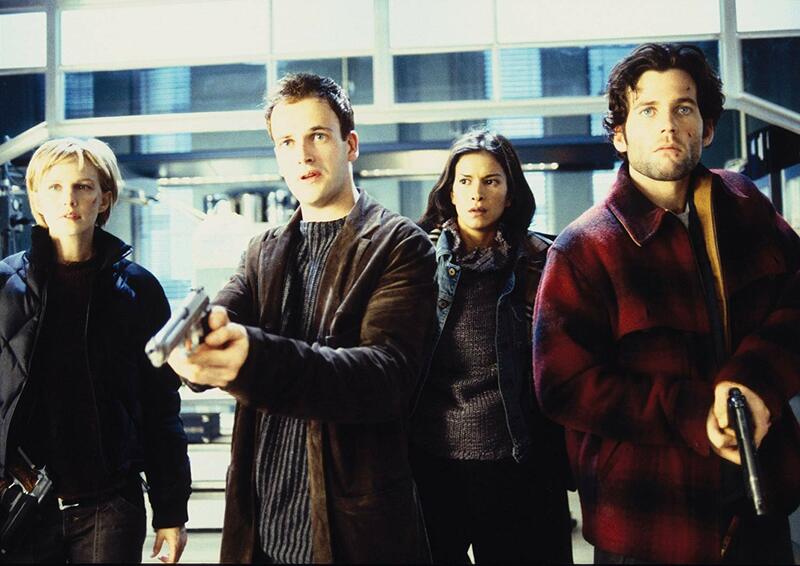 Mindhunters was a venture into the serial killer thriller mini-genre. It was one of several other films in the serial killer genre that came out that same year, along with Taking Lives (2004) and Twisted (2004) – although only the first of these was modestly successful (largely because it starred Angelina Jolie). The fad for serial killer/forensic profiling thrillers had peaked over a decade ago after the massive success of The Silence of the Lambs (1991) and fourteen years later it was feeling like a genre that had been creatively milked out in terms of originality. (The best works among these revivals of the serial killer genre were those that came from European countries such as Antibodies (2005) from Germany and the tv movies Cold Blood (2005-6) from the UK). In a very short space of time, Renny Harlin’s absurdly over-the-top set-pieces plunge Mindhunters down into bad movie stakes. In fact, you are groaning in disbelief from the very first scene where Harlin sets up an atmospherically detailed sequence where the agents enter a house where a serial killer has a woman prisoner and everything goes awry, before the entire scenario is preposterously revealed to be a training simulation. Once the film gets to the island, each of the killing set-pieces that Renny Harlin throws up are so over-the-top as to be laughable. Christian Slater has a ridiculous demise where he is blasted by liquid nitrogen and falls to the floor, shattering into shards like broken glass. One victim is touched whereupon their head falls off – the toucher somehow not managing to notice that the person had a severed neck – before the group finds that while they were out cold, the killer has drained the victim’s blood to paint the walls with symbols. Another victim lights a cigarette, which causes them to melt down because it is tinged with acid. There is a completely absurd scene full of ridiculously hyped false suspense where a broken light fitting turns a flooded floor into an area that is lethally charged with electricity and the wheelchair-ridden Clifton Collins Jr is left having to hang from pipes on the ceiling while LL Cool J has to kick and shoot holes in the wall to climb along and turn the power off. There is an amazingly silly climactic showdown between Kathryn Morris and the killer with both holding their breath underwater in a swimming pool and trying to shoot the other with a handgun poked up out of the water. The plot of Mindhunters has been loosely taken from Agatha Christie’s oft-filmed novel/play Ten Little Indians/Ten Little Niggers (1939) – see the film version And Then There Were None (1974) and the BBC tv mini-series remake And Then There Were None (2015) for details. Renny Harlin seems oblivious to the ridiculous twists and turns that the script seems to require – the climax, for instance, has not one but two people returning from the dead after we think these characters have been bumped off. Despite setting itself amid a group of forensic profiling trainees, the script never seems to be in the slightest rooted in any believable motivation or credible psychology. LL Cool J is revealed to be the killer and upon doing so turns psycho and advances on Kathryn Morris before he is downed and then later revealed not to be the real killer. While one has no particular problem with this revelation, it leaves a major plausibility hole ie. if LL Cool J is not the killer then why is he acting like one and menacing Kathryn Morris? Mindhunters is a ridiculous film and one where Renny Harlin’s absurd and over-the-top direction massacres an already preposterous script.